The Warsaw Police Department D.A.R.E. division met today to announce their 25th anniversary teaching students in Warsaw Community Schools. Photographed (from left) are D.A.R.E. officers Cpl. Doug Light, Cpl. Jaime de la Fuente, Sgt. Dave Morales and Ptl. Jeff Ticknor. 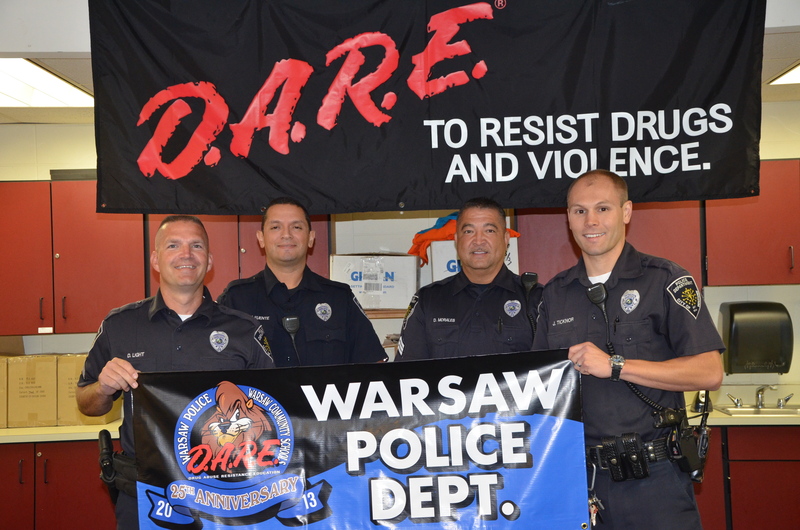 Members of the Warsaw Police Department D.A.R.E. (Drug Abuse Resistance Education) division met today to announce the 25th anniversary of teaching students at Warsaw Community Schools. The program, which is offered to students in sixth and eighth grades, has offered students lessons in decision making skill for a healthy life by highly trained officers for the past 25 years. According to a statement provided by the D.A.R.E. division, the division was started by WPD in 1988 and has continued to grow and bring cutting edge curriculum to students throughout the years. Officers with the program must undergo a rigorous training and selection process before acceptance as D.A.R.E. officers. The curriculum, which is scientifically based, is the national symbol for the Drug Abuse Resistance Education program which, in partnership with police officers, parents and schools, is in use throughout the country. According to Cpl. Doug Light, who has been with the program for 7 years, students meet for a total of 55 minutes and utilize a variety of approaches to learn how to develop the skills needed to avoid involvement in drugs, gangs and violence. In addition to learning how to avoid choices that could negative impact their lives, Light stated the program helps teach students how to also make decisions when weighing positive options. Four Lakeview Middle School students who have participated in the program visited the classroom today to discuss some of their views on the program and the effects it has had on their life. When asked if the program has helped with difficult decision making, eighth-grade student Joe Anderson stated, “I haven’t had to deal with anything (drug related yet) but I I will probably have to use this (D.A.R.E. training) in the future.” Anderson said the training has given him the confidence to handle situations related to D.A.R.E. and beyond in the future. According to both Sgt. Dave Morales and Light, the program’s focus is on providing students the tools to make healthy life decisions. “D.A.R.E. gives the tools to make better choices down the road, especially in high school where they are going to encounter different people and situations,” explained Morales. Light and Morales both stated that the major reward in being involved in the program was the reward of getting to know and help the kids they work with. Both Light and Morales talked of the numerous encounters they have had with students who participated in the program both during school hours and after school. “When people ask how are you rewarded as a D.A.R.E. officer, its by the interactions with the kids. I’ve received gifts of appreciation from students and it really means a lot. There are times where kids don’t want to talk to school authority figures or family but they are willing to talk to me. It means a lot to know they still have someone to talk to even if they’ve graduated from the program. When I go to Walmart or Meier, even if its just to pick up milk, my wife knows it won’t be a short trip because I am going to run into my D.A.R.E. students,” stated Light with a chuckle. Both Light and Morales noted the work of former officers in the program and the commitment to the program from both WPD and WCS. “I have to give a lot of credit to our former D.A.R.E. officers. They did an outstanding job and the continuation of this program really says a lot about our community and school corporation. A lot of times, when cuts are made, this program is the first to go. WCS has been very supportive of it as has Warsaw Police Department,” stated Light. If you are interested in making a donation to the D.A.R.E. program, you may contact Light at 574-372-9576.